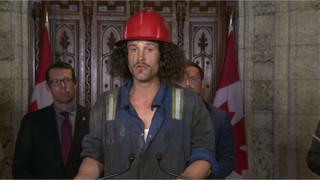 Canada may have found its very own Joe the Plumber in Bernard Hancock, aka Bernard the Roughneck, a 32-year-old oil-rig worker who made waves when he showed up to the House of Commons dressed in greasy coveralls and a red hard hat. Like the American Samuel Joseph Wurzelbacher, who rose to fame as a right-wing everyman during the 2008 US presidential election, Hancock has become the public face of the Alberta oil industry and its employees. His face and his trademark mop of curly hair are plastered on T-shirts and mugs. Last week, he appeared on Parliament Hill in his oil-rig getup to support a petition asking the federal government to do more to help Canada's struggling oil and gas industry. "Families are being destroyed," he said. The petition, which had 35,000 signatures, was tabled by Alberta Conservative MP Shannon Stubbs and organised by the Canadian Association of Oilwell Drilling Contractors (CAODC), a pro-oil advocacy group. Like many, Mr Hancock was lured out to Alberta with the promise of relatively high wages for relatively low-skilled work. Canada exports CA$220bn (USD$168bn; £129bn) in natural resources a year, mostly to the United States, and the sector accounts for 17% of its GDP, according to 2015 data provided by Natural Resources Canada. In Alberta, the third-largest oil producer in the world, the oil and gas industry employed approximately 155,000 people in 2015, about 11% fewer than in 2014, according to the Alberta government. The Canadian Association of Petroleum Producers says that since 2015, the industry lost 40,000 direct jobs - 100,000 when one includes indirect jobs. Industry advocates blame the downturn on the low price of oil, the cancellation of the Keystone XL pipeline project in 2015, and the federal Liberal government's proposal to introduce a carbon tax. Environmentalists say that further developing Alberta's oil industry could intensify climate change. Becoming a political symbol for one of the most controversial industries in the country hasn't been easy, Mr Hancock tells the BBC. He says he's been bombarded with threats and lewd images from people who say he's nothing more than a shill for big oil. "I started doing this to help Albertans in the patch that are struggling," he said, his voice raising. "I shouldn't have to deal with this." Mr Hancock, who say he struggles with anxiety and has lived on the street, said the negative publicity pushed him into a "downward spiral" last May. "I don't like being on the internet, I don't like being spotlighted," he said. But throwing himself into advocacy and finding work again in the oil patch this fall has given him a renewed sense of purpose, he said. "I don't think Canadians realise how important the oil and gas industry is for Canada to be a prosperous country," he said. He is articulate and well-versed on everything from parliamentary politics to the intricacies of laying pipe in an oil well, leading some to speculate he isn't a real oil-rig worker at all, but a hired actor. The rumour is fuelled by the fact that he performed in a community theatre in 2014. "People can't believe that someone who works in my job could be articulate, because it doesn't fit their stereotype about what a roughneck is," Mr. Hancock said. Mr Hancock says he hasn't acted since that local play in 2014, but admits he has a knack for drama. Appearing before the House of Commons as if he had just stepped off a rig - dirty face and all - was a calculated move. "Tell me, would it have had the impact that it did if I had come there in a suit? Was that not smart?" he said. Image caption Protesters take part in a rally in central London on April 11, 2013 to demonstrate against the Keystone XL Tar Sands Pipeline as foreign ministers from the G8 group of nations meet nearby. "In a way it's a bit of a stunt, but this is who I am, and this is what I look like at work." Mr Hancock's journey from "roughneck" - a term for an entry level worker on an oil rig - to oil industry advocate began in 2007, shortly after he finished his degree in English and media communication at Bishop's University in Quebec. After working on-and-off in the industry for nearly a decade, Hancock quit his job last January when his hours were drastically cut back, he said. He moved back home with his parents in Vancouver, and started attending pipeline protests in order to give voice to people in favour of developing Canada's oil industry. There, he was discovered by The Rebel, a conservative news organisation in Canada that now sells "Bernard the roughneck" T-shirts, for which he gets a small royalty. Mr Hancock says all proceeds he receives from the merchandise go towards charity. Soon after his involvement with The Rebel, Hancock reached out to the Canadian Association of Oilwell Drilling Contractors and began attending protests and doing other industry advocacy work. The group doesn't pay him for his advocacy work, but they did fund his trip to Ottawa, said its president Mark Scholz. "I think he's genuine,'' Mr Scholz said. "Speaking with him on-on-one, he has a heart for people and a heart for this industry." While some of the attention has been overwhelming, Mr Hancock said he believes that he's called to represent colleagues in "the patch". "They have just as much a right to have their voices heard as anyone else," he says.